A wheel chair porch lift gives individuals with limited mobility or in wheel chairs the freedom to enjoy their porch - like my Dad needed when he was ill. 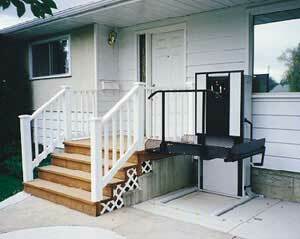 These lifts are also referred to as a vertical wheel chair lift, platform lift, or deck lifts. Manufacturers, like Bruno wheel chair lifts, offer you many different options and height capabilities. A vertical wheel chair lift like the one pictured above (Trust-T-Lift from RAM Manufacturing LTD) usually consist of a platform that travels up and down a stationary tower thereby raising or lowering an individual to a different height. The individual simply rolls onto the lift platform, pushes the lift button to rise to porch level and then rolls off the lift. Depending on the height the lift platform needs to travel, the whole process shouldn't take more than 30 to 60 seconds. Porch lifts can extend from approximately 3 feet 14 feet in height. 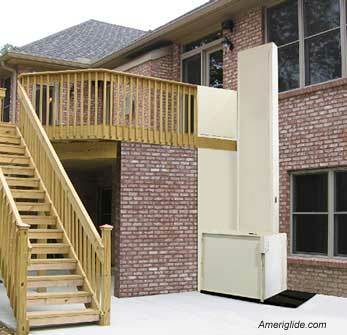 Most vertical wheelchair lifts are designed for straight-through access. The wheelchair enters on one side of the platform and exits through the other at destination. As some homeowners may need an adjacent access capability (for corner installations) or same side access, we recommend you contact a contractor prior to ordering your lift to ensure this configuration will work on your home. Then contact the lift supplier to ensure the access option you need is available. Purchasing Tips: Consider purchasing a wheelchair porch lift that will serve your needs but at the minimum height necessary to save on costs. Porch lifts can handle wheel chairs and scooters and can lift and lower up to 600 pounds. If you need a porch lift to reach a height just above the your lift model's capability, consider adding height to the foundation rather than opting for the next higher reaching unit. It could save you hundreds of dollars. If your porch or deck is fairly elevated, a Bruno wheel chair lift may be the answer. 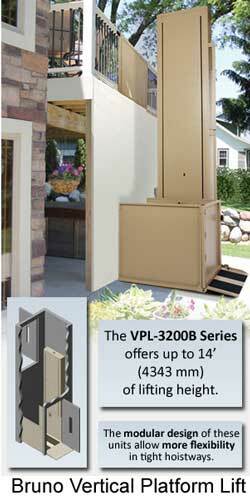 Their VPL-3200 B series offers lift heights up to 14 feet (like the one pictured at right). Most lifts are operated by a control panel which has an emergency stop switch, an up/down switch, and a key switch to control power to the unit. There is also a safety device beneath the left which will automatically stop operations when touched to prevent the unit from crushing pets, kids, or anything that may inadvertently find itself under the lift. Most units also have a switch at the top so you can control the unit from either height. Weather can be a factor. Although built for exterior use, snow can build up underneath and cause problems. To prevent this, the lift should be left in the down position, especially in snow country. Care must be taken when the lift is in the down position because there will be no protection on the porch or deck to prevent someone from falling. Placement of a self-closing gate is the most common remedy for this potential safety issue. In addition, some building codes require special slabs be poured upon which the unit will sit. Check with your local codes department to determine the specific requirements for your area. Most porch lifts must have a hard smooth and level surface upon which the toe plate can be mounted. We recommend concrete. The area should extend at least 12 inches larger than the base of the lift itself. The top plate must also rest upon the concrete. Allow for an additional foot to two feet of pad on side of the lift you enter to allow sufficient space for a wheelchair. This surface must be strong enough to handle the lift and it's maximum rated load. The travel wall is the wall below the upper entrance/exit point of the elevator. This wall should be vertical and smooth the entire distance without any protrusions of any kind. In addition, a 15 amp 100 vac is required for power. Before installing, be sure to see our installation code requirement considerations. 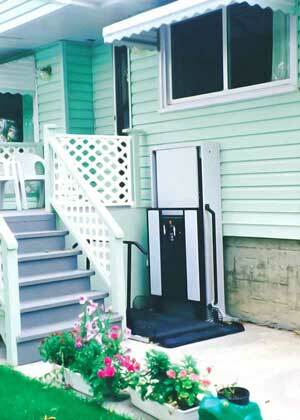 Designed for functionality rather than aesthetics, a wheel chair porch lift tends not to have a lot of curb appeal. But there are ways to integrate the lift into its surrounds for a more pleasing overall look. In the photo below a vertical wall made from the same material as the deck is used to conceal the partially conceal the lift. You can also use landscaping or hard scaping to achieve the same result based on the elevation of your specific lift. A wheel chair porch lift can be the perfect solution to your accessibility problem. Check out AmeriGlide's vertical wheel chair lift products like the one pictured below.